Chinese gymnasts Li Qi, Lan Xingyu, and Zou Jingyuan all won titles at the 12th FIG World Cup in Doha (QAT), 20-23 March, as individual Olympic qualification continued for Tokyo 2020. Doha's Aspire Dome, site of the 2018 Artistic Gymnastics World Championships, attracted more than 175 athletes from 57 nations. The competition was the fourth stage and marked the halfway point of the individual apparatus Olympic qualification, following competitions held in Cottbus (GER) in November, Melbourne (AUS) in February, and Baku (AZE) last weekend. China sent 14 gymnasts to Doha, the largest of any delegation, and were the most successful nation with three golds and a silver. 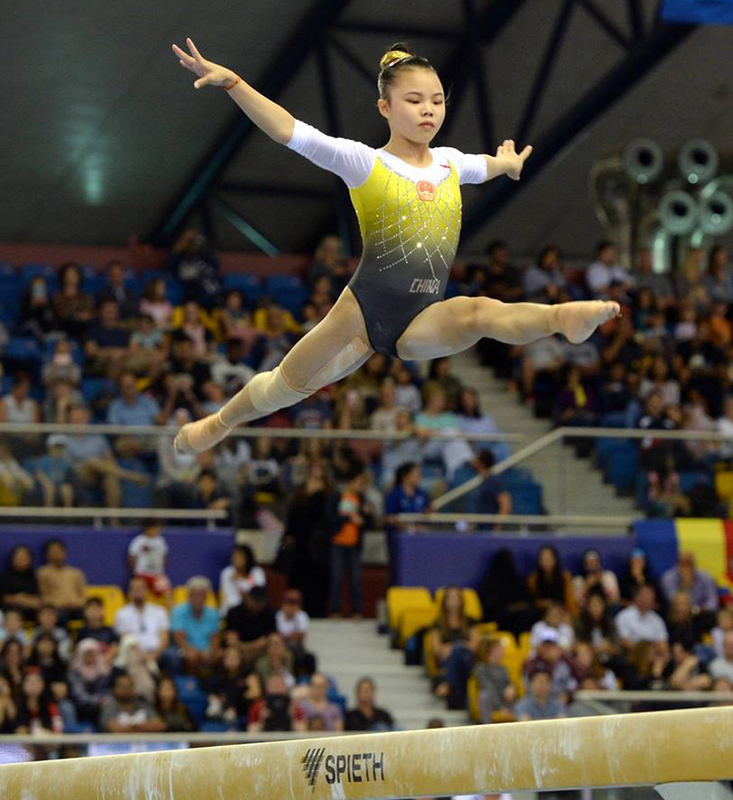 Competing in her first World Cup event, 17-year-old Li Qi cruised to gold on Balance Beam with a rock solid routine that scored 14.333. Li confidently performed a very high two-foot layout to straddle jump; a front aerial, switch leap, Onodi, double stag combination; back-to-back side jumps with a half-turn, and a double twist dismount. Nina Derwael (BEL) won the silver over Olympic finalist Marine Boyer (FRA), as the two gymnasts swapped places from last year's World Cup in Doha. Boyer now leads the World Cup standings on Beam. Lan Xingyu, an alternate to China's gold medal-winning team at the World Championships in Doha, won the gold medal on Still Rings with a 15.100 and 6.4 difficulty score. He was followed in the standings by Armenians Artur Tovmasyan and Vahagn Davtyan. Zou Jingyuan proved once again why he is the world champion on Parallel Bars, scoring 15.700 to defend his title from last year's World Cup event. Zou, whose 15.866 in qualification was the highest score of the competition, had a slightly overarched handstand but the rest was poetry in motion, ending with a stuck double front half. The champion in Baku, Vladislav Poliashov (RUS) won the silver, ending his routine with a difficult straddle front, uprise, double front-half dismount combination. Fourth in Melbourne, Mitchell Morgans (AUS) showed beautiful extended lines and ended his routine with a stuck double pike to climb onto the podium for bronze. 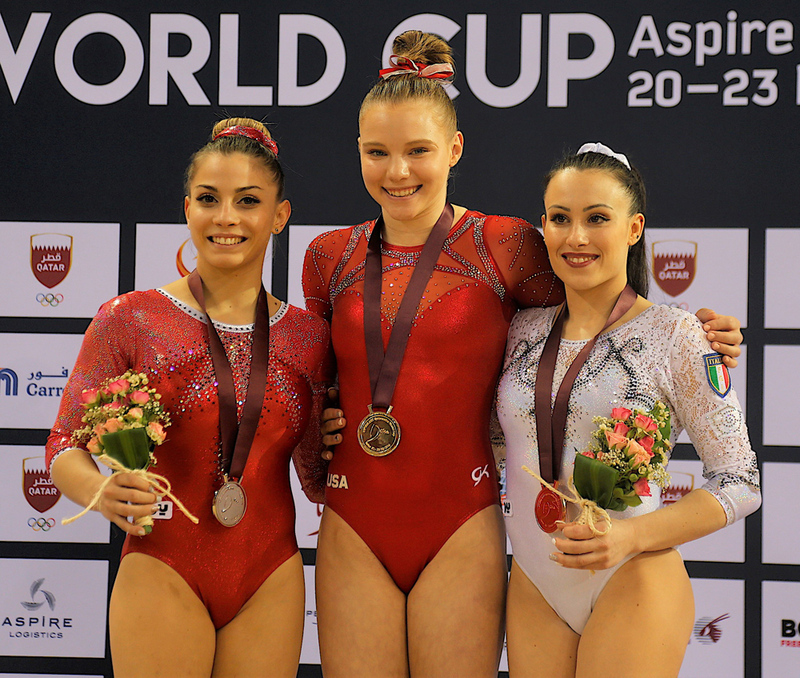 Jade Carey (USA) continued her streak of success, winning both women's Vault and Floor Exercise as she had in Baku. The 18-year-old Arizonan now leads both events in the World Cup standings. On Vault, Carey vaulted a Cheng Fei and double-twisting Yurchenko to narrowly defeat two-time world champion Maria Paseka (RUS), 14.883 to 14.766. Paseka, also a two-time Olympic Vault medallist on Vault, vaulted a Cheng Fei and stuck her Amanar to take second ahead of 2017 European champion Coline Devillard (FRA), who repeated her third place from the 2018 Doha World Cup. Carey tumbled the Code of Points on Floor Exercise, showing an excellent layout double-double (Moors); a full-twisting double layout; double-double; and running front to double tuck for 14.466 (6.2 difficulty). Lara Mori (ITA) won the silver (whip-full-in; 2 1/2 layout front; triple twist; double pike) over teammate Vanessa Ferrari, the 2006 world champion. Ferrari, returning from a torn Achilles in 2017, not only danced with real passion but looked strong with a double layout and full-in passes. On men's Floor Exercise, three-time Olympian Alexander Shatilov (ISR) won the gold with 14.633, mounting with a front double pike. World medallists Rayderley Zapata (ESP) and Carlos Yulo (PHI) joined him on the podium, with Yulo currently leading the World Cup standing. First in Cottbus and Melbourne, Lee Chih-Kai (TPE) made it three in a row with yet another victory on Pommel Horse. 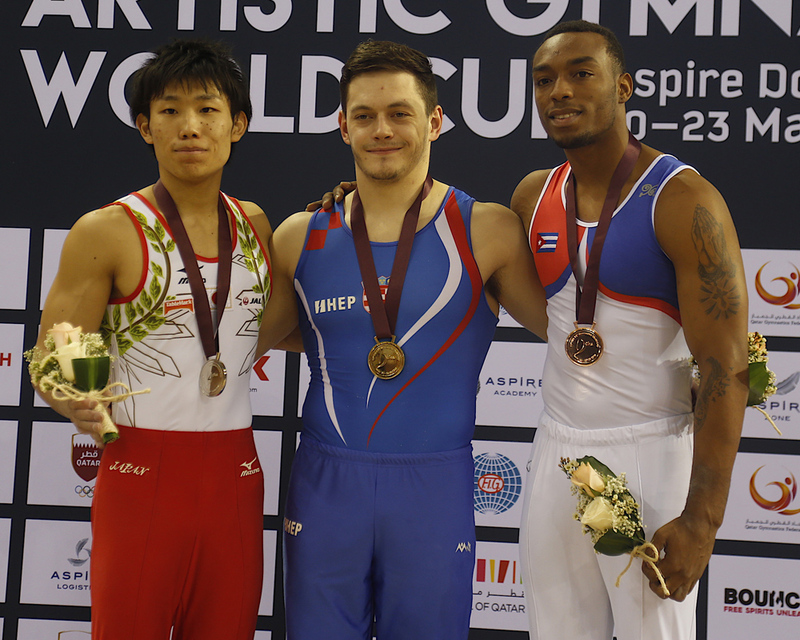 Second at the 2018 World Cup in Doha, Lee scored 15.400 for gold in Doha. Kohei Kameyama (JPN), the 2013 world champion, swung a 6.8-difficulty routine to tie Lee, but finished in a tie-break that favoured Lee's higher execution score. Teammate Kaito Imabayashi was also impressive, earning 15.333 (6.7) for bronze. Golden in Baku, 2012 Olympic champion Yang Hakseon (KOR) once again vaulted to the gold medal, averaging 15.266. Yang showed no signs of the injuries that sidelined him in 2016, vaulting his own Yang vault (triple-twisting handspring layout front) and a 2 1/2-twisting Tsukahara. Defending champion Igor Radivilov (UKR) finished second, vaulting a Dragulescu and Tsuk double pike. Artur Davtyan (ARM) vaulted a Dragulescu and 2 1/2-twisting Tsukahara for the bronze, matching his brother's result on Still Rings. Nina Derwael returned to the Aspire Dome, the site of her historic world gold medal on Uneven Bars, to defend her World Cup title. Derwael performed her spectacular non-stop routine (Nabiyeva; Ricna-half to Yezhova to immediate Stalder-Shaposhnikova-Bhardwaj; Van Leeuwen; toe-full full-twisting double) for 15.033. Two-time world champion Fan Yilin (CHN) matched Derwael's difficulty score of 6.5 with her own intricate routine, but settled for silver by 0.1. Anastasiia Iliankova (RUS), second in Baku, won the bronze. 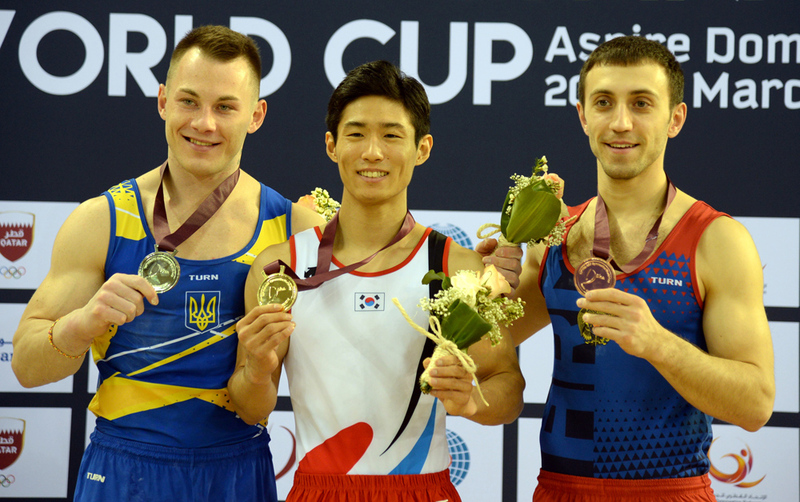 2017 world champion Tin Srbić (CRO) also defended his World Cup title on Horizontal Bar, performing a Stalder-Tkatchev (Piatti); Tkatchev; layout Tkatchev; Tkatchev-mixed grip; layout Tkatchev-mixed grip (named after his teammate Marijo Možnik), and full-twisting double layout for 14.400 (6.1 difficulty). Hidetaka Miyachi (JPN) went big with five release moves (Miyachi; Cassina; Kovacs; Kolman; Yamawaki) and a stuck full-twisting double layout to finish 0.1 out of first. 2016 Olympian Randy Lerú (CUB) caught a beautiful Liukin (full-twisting layout Tkatchev) for bronze. World and Olympic champion Epke Zonderland (NED) fell on his Cassina to Kovacs combination for seventh. For the first time, gymnasts will be able to qualify directly to the Olympic Games though the FIG World Cup series. Nations that qualify full teams to Tokyo will have a chance to qualify an additional two gymnasts as individuals through the World Cups, while nations that do not advance will full teams will have opportunities to earn berths through the 2019 World Championships in Stuttgart (GER) and through the World Cup series. 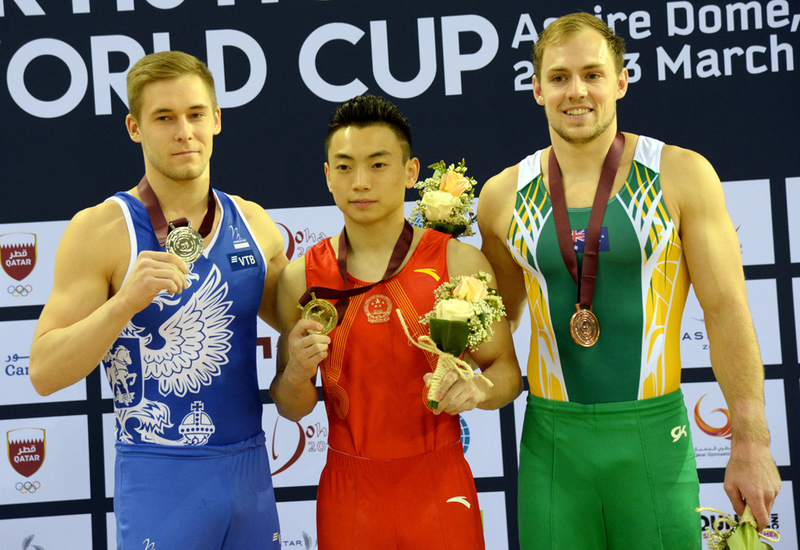 Points will be awarded by placement on each individual apparatus over eight World Cups taking place through March 2020, with two each in Cottbus (GER), Melbourne (AUS), Baku (AZE) and Doha (QAT). The top 12 gymnasts on each apparatus earn points, with 30 points for first place, 25 for second, 20 for third, through 5 points for 12th place. Click here for Olympic qualification guidelines and click here for applicable rules. The FIG Individual Apparatus World Cup series continues with the 44th Turnier der Meister in Cottbus (GER), 21-24 November. Click for the men’s and women’s world rankings in Artistic Gymnastics.